Hi Andrew, thanks for the response. There have been multiple versions of the D-Link DGS-1005 switch. The one I have in particular has plastic housings. No metal at all. There are no metal tabs inside either. It’s completely plastic. The comment about the shield connection and RF antenna connecting to the ground plane of the BDP-1 is one that I’ve thought about as well. I’ve been trying to reason how/if that could explain why the SSTP cable comes across as quieter. Although, while contaminating the ground, is it also more likely to stop RF leakage within the chassis? I’m questioning if I’m seeing some tradeoffs in the sound. That’s partially why I didn’t make my choice for preference. This can also vary from track to track. In general, the STP appears to have a darker background with the plane of the music a bit recessed and what appears to be clarity. The UTP’s plane is in front of the speakers. Sometimes the music, in comparison to STP, comes across as more warmer with perhaps more grain, which very well could be better harmonics. The other thing where the difference really shows is in bass region. I’ve used solo tracks for drums and percussions and you can really hear the difference in how the transients are rendered between the two as well as body. I’m trying to make sense of what I’m hearing with what’s happening with these cables. As you pointed out, the connection to ground plane is not a preferable one. However, I wonder if does it help with any noise leakage? The one good thing about this is that I can use the BDP-1’s native MPD software with a flash drive without ethernet and use that as a reference to assess whether UTP or STP is closer to that sound. No comment about reduction of noise/EMI/etc. is valid unless it is accompanied by measurements. Just thinking it is happening is not the same as it being so. Absolutly true. There are sooo many totally wrong assumptions by audiophiles on how things work in reality. One thing I do meaure when installing audio systems is ground noise between components by a simple 30mhz scope, I don’t have a ghz spectrum analyzer so it does not tell everything but at least a lot more then just assumptions. All I can say is that shielded network cables are not allways preferable, it depends on the situation. Second thing I can say is that a lot of lineair power supplies inject more noise into the system then a good designed smps, (not talking about the $2,- chinese crap wallwarts) another false generalisation. One is not better or worse then the other, it totally depends. It all says absolutly nothing without at least some simple measurements, that’s absolutly true. Mark Brown previously made a good point about doing a simple experiment: “Does the sound change if the ethernet cable is pulled?”…unfortunately, that simply is not possible with Roon and BDP-1. There is constant network traffic at all times and if the ethernet cable is pulled, the music stops almost immediately. Then do it with JRiver direct (bypass Roon) Set JRiver to cache the entire track. I’ve never debated the point that there could be a difference in UTP vs STP. Just that a $700, 3 foot cable, is just absurd. That I will on the spot make a like constructed cable that you can’t tell the difference between when bias is controlled for. And looking at the graphs to back this up: They are all in the MHz range. 20-20KHz performance is a non-issue. Yup. Simple, convenient, no cable clutter. Stability and latency hasn’t been a problem either. Cheaper than the ethernet setup (switch, cables, LPS) as well. I can tell you from experience that WiFi can add audible noise to the mix. I experienced this using hardkernel’s USB based WiFi dongle for the Odroid. Pop on some cans with the Odroid feeding a DAC via USB and the noise/interference is clearly audible. Same Roon Bridge endpoint fed via ethernet is comparatively silent. Then replace the stock psu with my linear and the noise floor drops. I don’t doubt your experience, but it sounds like something was not implemented well in that configuration. Like some other radio interference being transmitted as EMF and making it all the way to the analog section of the DAC. I have no experience with those devices, but the simple fact that the signal is digital over wifi and should just be ones and zeroes through the USB connection means that noise had to be an electrical issue of sorts? that noise had to be an electrical issue of sorts? Absolutely it’s electrical… It’s the usb WiFi dongle that’s noisy. I’ve since tried another that’s more powerful but lives on a leash and it’s quiet. I might have to agree with you regarding the USB dongle. Now I haven’t had it for a long time, so my opinions are subject to change. For reference, I do have the BDP-1 local playback with flash drives and ethernet via LPS as something to compare to. It lets me know if any changes are moving towards or away from it. I did add a spare Jitterbug and it helped bring the sound closer to what I was hearing previously. Connection wise, I’ve tried local playback with flash drives, bridged ethernet connection between Mac and BDP-1 without any switches/routers, powerline adapter, switches powered by stock ungrounded power and LPS, shielded and unshielded cables with various grounding. I obviously don’t have any tools or measurements to offer. I can only offer my experience and try to make sense. I’ve noticed 2 audible aspect in particular that were variable to me between these configurations. It’s hard to tell how these interact and compound. Noise floor (perceived?) - How black the background appeared. Usually the more black the background is, the more dynamic things sound and clear. The flash drives with local storage is right at the top. I found the powerline to be the worst at this, aside from other obvious audible/interference problems. Having the switch powered by the LPS brought the lowest that I could with ethernet. Treble modulation (RF?) - With some combinations, especially when swapping out for grounded shielded cables, I noticed that it was possible to keep the noise floor relatively same, but somehow the sound’s character would change in comparison to UTP. It would be bright and this may result in the appearance of more detail. UTP connection sounded warm and sonically the same as flash storage playback. Only slight difference was in perceived noise floor. Both were dry and warm sounding. I have 2 instances of this. It holds up with both wireless dongle and wired. When I used the LPS powered switch and swapped out for UTP and shielded ground connected cables, the noise floor appeared very similar, but one was a bit bright and thin sounding with a regressed plane. I’ve been told this is attaching a RF antenna to the ground plane. With the Wifi dongle and nothing attached to the BDP-1, the noise floor was quiet as local drive playback. However, the sound did come a bit bright and splashy sounding like with the shielded cables. I added the Jitterbug and the noise floor stayed the same, but the sound become more like how UTP sounds. I suspect these differences may come down to complete galvanic isolation and any RF interference. 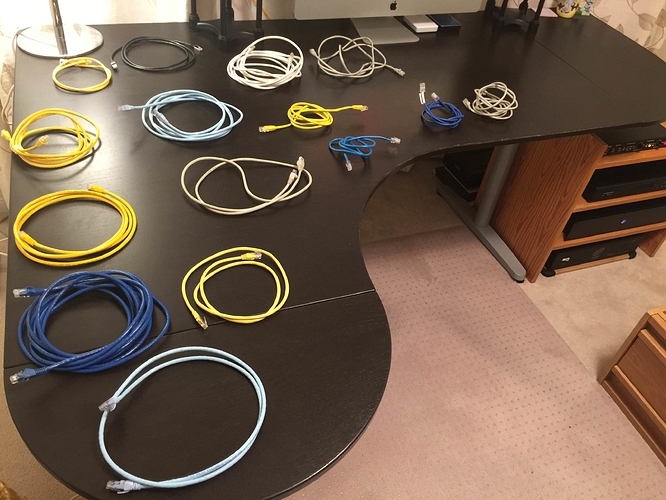 I just want to reiterate that all these devices and network gear, including cables, were in the $5-$20 price range. The most expensive thing is the Jitterbug at $50 and Teradak LPS for the switch at $50. I’m not advocating spending crazy money on this. This was mostly for me to try and make sense of things. I know there will be plenty rushing to say this is all in my head. Fair enough as I cannot offer any measurements. For me, the challenging thing actually has not been detecting differences. Rather, it has been trying to make sense of these differences. People differ quite a bit in their sonic preferences. So my opinion of which sounded better wouldn’t be useful to anyone else. Instead, I wanted to try and figure out which sounded more ‘correct.’ Having that baseline of local storage playback helped in navigating. Still, it’s very tricky. This is why I’d love to see fiber ethernet inputs on endpoints. Leave it completely to the manufacturers to be the ones generating and controlling the noise at the transceiving end. No arguments about incoming noise. Any noise generated will be their own. They should control for that. The other one is Wifi which is a lot more convenient. Complete isolation as well. It’s up to the manufacturer to deal with any RF issues generated. It seems that most Auralic users also prefer the wireless connection over the wired. I’m curious if anyone has examined signal integrity between different ethernet cables and whether it had any impact on the processing power of the PHY? Or even looking at the PHY’s themselves for any variance in different designs/implementation and how they handle an incoming signal? One link below. When it’s mentioned John knows about the Broadcom chips from the inside, it’s because John Swenson used to work for Broadcom, among other places. I suspect the LED in my USB dongle hanging off a Raspberry Pi. I am planning to switch it off in DietPi using this guide. Thanks. I hadn’t read that one, but did come across across other posts from John. In my mind, I was ideally thinking of a test being conducted in a quiet and isolated area where you don’t have to worry about external noise or other gear interaction. That way the results are more representative about that closed system. Maybe even a ‘quiet’ house setting could have sufficed? It’d have been interesting to see how each cable behaved at various lengths (less than a foot, 2 meters, 10 meters, max length). The sample would consist of Cat 5e/6/6a cables from different manufacturers. You could even throw in various shielded designs (F/UTP, STP, S/STP) that were completely floated, so ground isolated like UTP. In a location where the shielding is not needed, would the ‘average’ shielded cable design of each type make things better or worse with regards to signal integrity? In a location where the shielding is not needed, would the ‘average’ shielded cable design of each type make things better or worse with regards to signal integrity? Have you thought about asking John directly on CA Forum? He’s pretty easily reachable and shares a lot, as you’ve probably seen on other topics. No, I haven’t asked him there. I’m not really active on CA and I would’t know where to ask him? This is something that was on my mind very early on, and I had no idea about signal integrity even being a thing to consider at that point. I thought it was all about shielding vs. unshielded and so just chalked any tiny perceived differences between the UTP as me hallucinating since I had no rationale behind it. (I’m sure people will rush to point out that I’m still hallucinating ) To be fair, it was completely overlooked because once you start connecting the shield to the ground, things start to sound a lot different. So in comparison, I never found it necessary to look at differences among various UTP or ungrounded designs. I still haven’t gotten around to comparing the UTP, so I’m not claiming anything here. About a month ago, I did make a single change elsewhere in the rig (AES cable replaced) and I could still hear the differences between the cables that I tested and they still sounded the same tonally as before, however, my ‘interpretation’ of it was different this time around. The ‘detailed’ shielded cables became more harsh and reserved this time with a collapsed plane. The somewhat muddy UTP cables went from muddy to smooth…same tonality regardless of the AES cable, different interpretation. As of now, my listening results do in fact line up with the expected results based on the recommendation given by many here. Hearing the changes is one thing. Making sense of them is another. I have a tiny sample of various 5e/6 UTP from different brands and in varying lengths. Majority of the 5e were included in various products. The various Cat6 UTP I got from data centre. The only cables I paid for was the S/STP and even that was only $5 per piece. No real financial investment on my part or need to justify a purchase. I’ll leave it here for now.